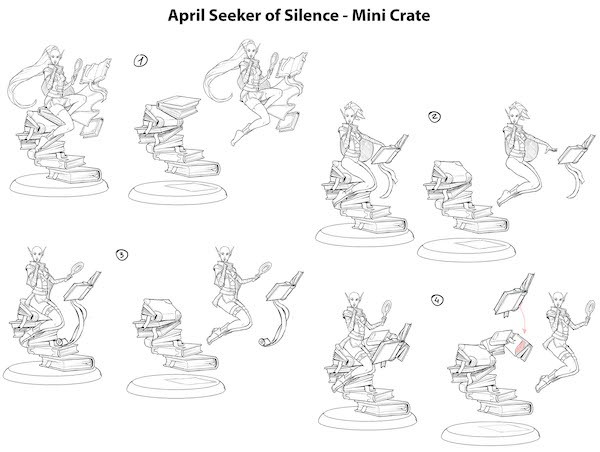 [The] Seeker of Silence, is a gender-bent version of Sylys Wyshnalyrr as an Elven magic librarian with a late 1930s classic pinup influence. Andrea Uderzo got to work and sent me the first round of sketches. – Slim the book pile mass down to the minimum we can get away with artistically. – Part count is a bigger deal here than mass, and opening the collar to align the right side of the collar with the right arm to fill the gap will help keep the right arm attached to the body. – To keep the left arm attached, we would need to change its position to something like holding the magnifying glass flat against her left thigh. – To help save mass with the hair, going with a bob haircut could also help and be used to fill the gap between the head and ears. The two primary contenders on the design are #1 and #4. In this iteration, we were getting closer, but the pinch point needed to be eliminated in the cape area, with book stack from #1 being the most ideal. With those changes implemented, the character on her own was finished. The only thing left to do was to draw the back view so that we had solid reference for the sculptor. 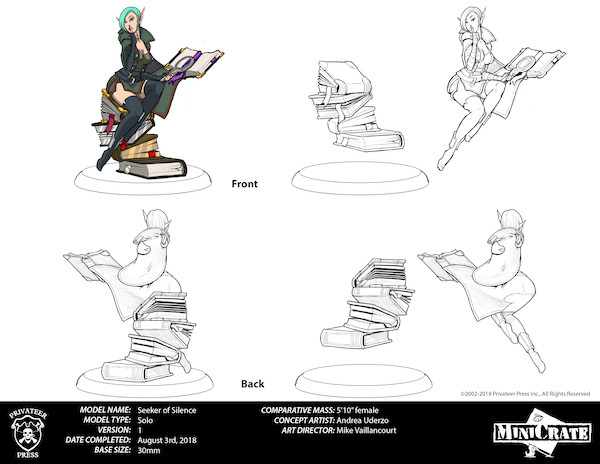 As per the norm for the concept art, the last task to establish was the color scheme. Of course, once this made its way into the sculpting stage, the stack of books became a new problem for engineering, but our team did a fantastic job of solving that problem in conjunction with production. Overall, I’m rather happy with this nod to classic bomber nose art, and I think she’ll make a great table proxy for one of my favorite solos!